Published by the American Geophysical Union as part of the Special Publications Series. 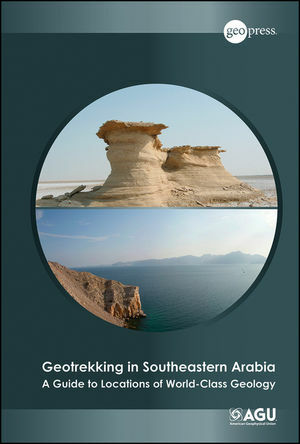 Geotrekking in Southeastern Arabia presents the world's most diverse geology and reveals some of the unique rocks that were once covered under shallow seas and are now sub-aerially exposed. This guidebook describes various routes that leads to specific locations for viewing the distinctive and world class geology of the United Arab Emirates and Oman. Each route includes specific directions, satellite images, illustrations, and explanations that can help with locating the outstanding geology of the area. Certain sites preseve the world class ophiolites — a section of the Earth's oceanic curst and the underlying upper mantle that has been uplifted and exposed above sea level and often emplaced onto continental crustal rocks, a unique process of the Earth described by plate tectonics. The shallow land and high evaporation conditions in the western region of the UAE forms giant, salt-lined mudcracks and the growth of gypsum clusters called "desert roses"
Benjamin Jordan, an eminent oceanographer and a volcanologist, is an Associate Professor in the Physical Science and Oceanography department at the Brigham Young University in Hawaii. His research interests include i) correlation of volcanic deposits with their sources using geochemical and geographic tracers, ii) establishing and maintaining a database of local oceanographic variables, and iii) development of remote monitoring tools for lava-ocean interaction.